On Wednesday, January 16th at 7:00 pm at the Cook Memorial Library in Tamworth, Kristine Rines, Wildlife Biologist for the New Hampshire Fish & Game Department will present a program on the moose population in New Hampshire. She will review the life history and historic occurrence of moose in this area. 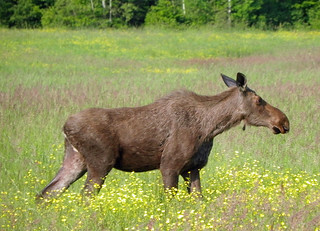 She will also discuss the current status and management practices, and the results of recent research on moose in NH. A native of New Hampshire, Kristine has been the moose project leader for Fish & Game for 27 years. She is a knowledgeable and entertaining speaker so put this on your calendar! Call the library at 323-8510 for more information.